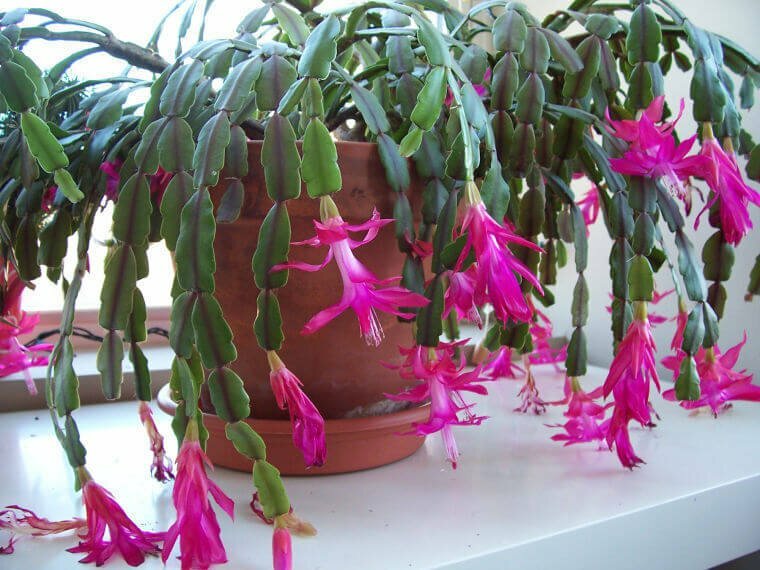 Christmas Cactus (Schlumbergera bridgesii) is an ornamental, flowering, succulent plant. It has dark-green flattened stems composed of segments joined in a scalloped pattern. The flower produces a unique, tube-shaped double flower appearance, with the outer flower being formed by shorter leaves that curl back near the flower’s base, and the inner flower being formed further up the flower, near the stamen are available in shades of pink, red, purple, yellow, and white. They bloom from mid-November and January. It looks great when growing as an indoor and hanging plant. Common Name: Christmas Cactus, Holiday Cactus. To set flower buds, the plant needs cool 60-65°F/16-18°C days and 45°F-55°F/7-13°C nights. Once buds set, 70°F-75°F/21-24°C days and 60°F-70°F/16-21°C nights. Plant death can occur at below 50°F (10°C). Water regularly, keep the soil evenly moist but not soggy. After flowering, water sparingly until new growth begins in spring. Fertilize every two weeks with a balanced liquid fertilizer diluted by half. After blooms have dropped, stop fertilizing for a month. It can be easily propagated by stem cuttings. Take stem cuttings from one to four segments. Allow the cut ends to dry for 24 hours before placing upright in moist perlite. Rooting occurs between 3-4 weeks. It is rarely propagated by seed, sow seeds in the spring. 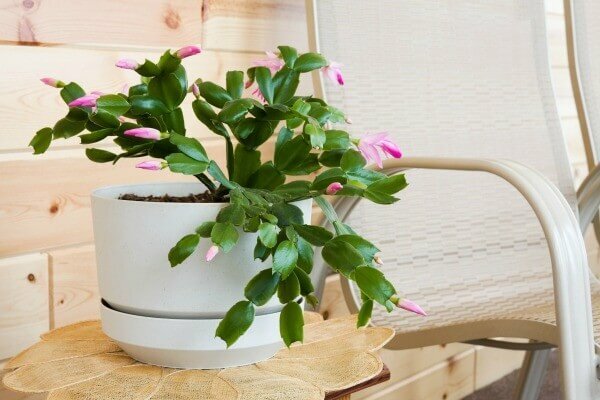 Christmas Cactus has no serious pest or disease problems. Watch for spider mites, mealybugs, and fungus. Add an insecticide to the water 2 to 3 times a year to combat pests as well as a systemic fungicide to prevent the orange and brown spotting that sometimes affects them.